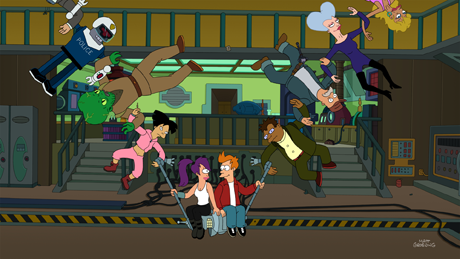 The final episode of Futurama, entitled "Meanwhile," airs tonight, September 4th, on Comedy Central at 10:00pm. The episode will be preceded and followed by Futurama Live!, a pair of live-streamed video chats featuring creators Matt Groening and David X. Cohen, cast members Billy West, Maurice LaMarche, Phil LaMarr and Lauren Tom, writer Patric M. Verrone and animator Pete Avanzino. The pre-show kicks off at 9:30/8:30c and the post-show starts at 10:30/9:30c. Both installments of Futurama Live! will be moderated by Chris Hardwick and will stream on the Futurama site and the Nerdist YouTube Channel.